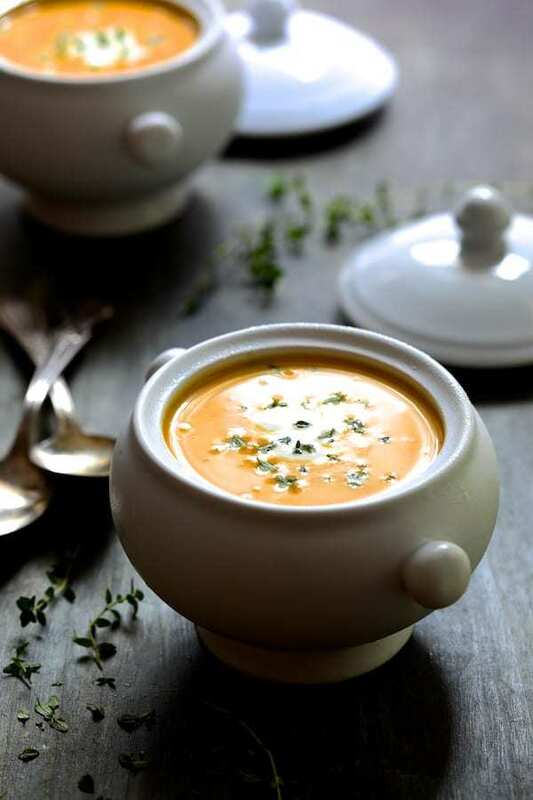 Butternut Squash Soup with Thyme and Taleggio is an elegant, rich and creamy soup that's perfect to serve this fall and winter! Heat olive oil and butter in a large soup pot or Dutch oven over medium-high heat. Add the onion, celery and carrot and cook 8 to 10 minutes or until vegetables begin to soften. Add the garlic and cook briefly until fragrant, 30 seconds. Add the chicken broth and cubed squash. Cover slightly and cook over medium-low heat for 20 to 25 minutes or until the squash and other vegetables are very tender. Add the fresh thyme, Taleggio and heavy cream. Stir until cheese is melted. Using an immersion blender, puree soup until smooth. Season to taste with salt and black pepper. Add a pinch of cayenne if desired. Garnish with fresh thyme sprigs if desired.